RITA Award Double Nominations: Long Historical, for THE BUTLER DID IT, 2004. Single Title Contemporary, THIS CAN'T BE LOVE, 2004. RITA Award: Best Regency, 1984. 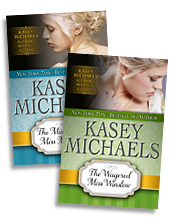 Kasey has appeared on the Ingram "Top 50 Requested Romances"